The Virgin Islands National Park is such a huge part of what makes St John unique. With over 7,000 acres under its protection – the park spans almost 2/3 of the island. Within these borders are indigenous plants ( some found only on St John), birds, animals, hiking trails and history dating back to 1100 AD. Within the Virgin Islands National Park you’ll find a wide variety of western tropical Atlantic terrestrial, coastal and marine ecosytems. Among them you’ll discover beaches, mangrove lagoons, salt ponds, arid and tropical forests; as well as protected reef systems, cays and sea grass beds that are the foundation of the sea life surrounding the island. The Park also protects many of St Johns historic plantation ruins. From the establishment of the earliest Dutch holdings in 1694 through the emancipation of slavery on the island in 1848 – St John has seen both the growth and abandonment of the sugar industry. Much of that history is preserved in the many hiking trails and ruins that can be found on St John. The Cruz Bay Visitor Center is open daily from 8 a.m. to 4:30 p.m. and is just a short walk from the public ferry dock. The center offers exhibits, brochures, maps, books and activity schedules. Park rangers can help you plan your visit, including hikes, historical tours, snorkeling, cultural craft demonstrations, and evening campground demonstrations. 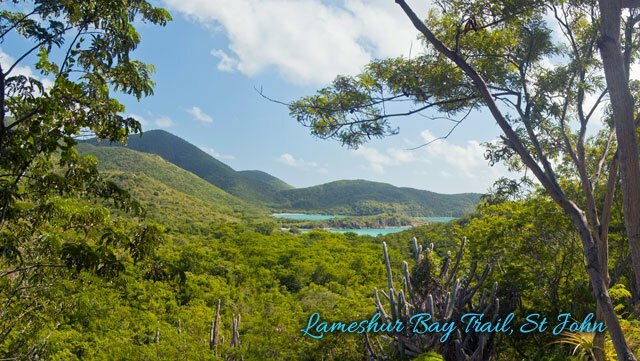 Popular Destinations – Three beautiful beaches on St John and a campground are just part of the park facilities. The picnic areas are wheelchair accessible. Trunk Bay is considered one of the most beautiful beaches in the world, and has an underwater snorkeling trail. Other facilities include a bathhouse, snack bar, souvenir shop and snorkel gear rentals. Lifeguards are on duty daily. These facilities close at 4:00 PM. Cinnamon Bay has a water sports center that rents snorkel gear and windsurfers, and can arrange day sailing, snorkeling and scuba diving lessons. A campground with bare tent sites, prepared sites and cottages is adjacent to the beach. There is also a camp store. Call 340-776-6330 or 800-539-9998 for camping reservations. The campground closes to unregistered guests at 10:00 PM. Hawksnest has changing rooms, picnic tables, grills and restrooms. It is the closest beach driving from Cruz Bay. Restroom facilities do not close, but amplified music is not allowed and there is a 10 PM noise curfew. Anchoring Anchoring permitted in either of two designated anchorages: offshore Francis Bay and Lind Point. Click on the features to see the areas and learn what size vessels can anchor in what areas within Virgin Islands National Park. In all cases, when dropping an anchor in an allowable anchorage, no part of the anchor or chain can be in contact with coral. “Look below before you throw.” All anchors must be dropped only in sand. If you are not positive that you are dropping your anchor in sand, DO NOT DROP THE ANCHOR. Vessels over 210 feet length overall (LOA) are prohibited from anchoring in the park. Avoid Areas The operator of a boat needs to be aware of surroundings to avoid damage to the marine life, boat, and people. This layer shows the location of swim areas – boats are prohibited from operation in these areas. It also shows the location of Johnson’s Reef, a shallow reef on the northshore. Boats need to operate outside the markers which outline this reef. Beach Access These are the locations of beach access channels. These are pathways for small vessels to access a few beaches. Vessels under sail or motor less than 26′ LOA may access beaches inside Boat Exclusion Areas where beach access channels have been provided. A red and green buoy designates these channels. Vessels under sail or motor must stay inside these channels. Vessels that can be pulled completely out of the water may be kept on the beach while the occupants are using the beach, all other vessels must immediately leave the boat exclusion area after picking up or dropping off passengers. Boundaries This layer shows the location of park boundaries as well as areas within park boundaries where anchoring is permitted. Fee Pay Stations There is a self-registration fee of $26.00 per overnight for anchoring or mooring between the hours of 5:00 p.m. and 7:00 a.m. Golden Age/Access Passport holders pay half price. Overnight fees must be paid prior to spending the night. Overnight stays in the Park waters are limited to 30 nights in a particular calendar year, and no more than seven consecutive nights in one bay. Payments are deposited in an envelope (found at this station) within this floating pay station. Floating Fee Stations are found at Leinster Bay, Francis Bay and Caneel Bay. Land-based fee stations are found Cruz Bay Visitor Center (near the flag pole), Salt Pond Beach and on the VIERS dock in Lameshur Bay. Moorings Moorings of various sizes and colors (ball and stripes) are used to designate specific uses. WHITE MOORINGS with BLUE STRIPES can be used by vessels less than or equal to 60′ length overall (LOA). LARGER WHITE MOORINGS with BLUE STRIPES, “Big Boat Moorings”, can be used by vessels 61′-100′ LOA. ORANGE MOORINGS with BLUE STRIPES are for use of vessels engaged in snorkeling or SCUBA diving. YELLOW MOORINGS with BLUE STRIPES are for permitted hardnose fishing offshore Cabritte Horn Point in Virgin Islands Coral Reef National Monument. BLUE MOORINGS with WHITE STRIPES are commercial moorings. Vessels with Virgin Islands National Park or Virgin Islands Coral Reef National Monument commercial use permits have priority use of these moorings. BLUE MOORINGS with RED STRIPES are concessionaire moorings. These are found offshore Caneel Bay Resort and are for the exclusive use of Caneel Bay Resort boats only. Guidance when using a mooring or operating a vessel within a mooring field: 1) No anchors can be used when using a mooring. 2) Securing vessels to the mooring using stern cleats is prohibited. 3) Fishing from any NPS mooring is prohibited (exception: while fishing for hardnose on YELLOW MOORINGS located in the Virgin Islands Coral Reef National Monument). 4) Use of bright deck lights or any underwater lights from boats to attract, or other purpose, is prohibited in Park or Monument waters. 5) Vessels on moorings and utilizing a second vessel great than 16′ LOA as a registered tender, the combined LOA of the two vessels must not be greater than the mooring (length) rating, either <61′ or <100′. 6) NPS mooring shall be vacated when tropical storm warnings are forecast for the area. 7) NPS moorings shall not be modified by any user unless under the terms of a written NPS permit. 8) Operating a vessel in excess of 5 mph or creating a wake in mooring fields or within 500 ft. of a mooring field is prohibited. Snorkeling Areas Over 40% of Virgin Islands National Park is underwater. Mangrove shorelines, seagrass beds, fringing and patch reefs offer an ample and diverse array of snorkeling opportunities. However, defining the “best” is highly subjective, based on factors such as individual snorkeling – swimming abilities, water and wind conditions and the marine life particular to a given site. This guide describes a variety of potential snorkeling areas so that you can determine what’s best for your own interest and expertise. It highlights areas easily accessed by road or trail and is not intended to be a comprehensive guide to all St. John snorkeling spots. The information in this section comes from the Virgin Islands National Park pamphlet of the same name, by Virgin Islands National Park Interpretative Ranger Don Near. Visitor Center Area The NPS visitor center is located in Cruz Bay. It is open from 9:00am to 4:30pm, daily, except closed Christmas day. Telephone: 340-776-6201. Men’s and women’s bathrooms are available as well as a dinghy area, 3 hour daytime anchorage and sea plane ramp.